Former Metro Restaurants executive Gary Rasmussen, at the Mission Training Center in Provo, Utah, will start a three-year mission in Japan on Wednesday. Quit your job as chief financial officer for Metro Restaurants: Check. Tell your wife you were offered a three-year unpaid stint in Japan as a Mormon mission president: Check. Lease your house, pack your bags and send 2,000 pounds of stuff to Sendai before starting work on Wednesday: Check. Gary Rasmussen, 59, and his wife, Pam, leave today for their new adventure. “My wife loves to sew, so we sent her sewing machine, and clothes, some books, my bicycle — a Trek road bike,” Rasmussen said last week during a telephone interview. The couple were driving toward Salt Lake City to pick up a shuttle for a missionary training center in Provo, Utah. After a few days in Provo, the Rasmussens will leave this afternoon and arrive in Sendai about 9:30 p.m. Tuesday. Gary will start work the next morning. In order to join her husband, Pam Rasmussen left her job as a campus support specialist at the Institute of Religion on the University of Arizona campus. The two have been married for 38 years. They met when they lived across the street from each other in Soda Springs, Idaho. They have six children ranging in age from 30 to 37 — three girls, three boys. The sons and one daughter each have served missions. The couple also have 23 grandchildren, with two on the way. They said they plan on a lot of Skype time to keep in touch with the family. 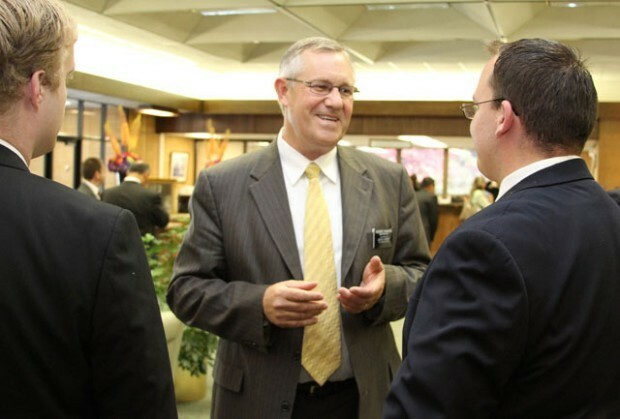 As a 19-year-old, Rasmussen served his first Mormon mission in 1970 in the Tokyo area. Metro Restaurants owner Bob McMahon has known Rasmussen more than 20 years since he hired him in 1992 at City Meat and Provisions Co. McMahon brought him back since 2000 as CFO. Rasmussen will supervise 70 people — 66 missionaries and two couples. The missionaries will be 19 to 22 years old. Women serve for 18 months; men for two years. About half of the missionaries are Japanese nationals, and the others are from United States, New Zealand and Australia. Rasmussen will travel around the area and meet one-on-one with each missionary every quarter. “Eighteen months or two years passes quickly,” he said. Rasmussen said the seven-day-a-week mission begins at 6:30 a.m. Language is studied for one hour to 90 minutes and then Scripture is studied. The missionaries are on the street by 10:30 a.m. and back at their apartments at about 8:30 p.m. Mondays are prep days, where missionaries spend a half-day doing laundry, writing letters home and food shopping. “It’s fairly intense. It’s not a vacation,” said Rasmussen, noting that part of their job is to help clean up from the recent earthquakes and tsunami. Rasmussen said about 125,000 Mormons live in Japan. He estimated that 1 percent of Japan’s residents are Christian, with about 10 percent of those being Mormon. His Japanese, while rusty, came back quickly. “I’m surprised that it’s coming back so well,” said Rasmussen, who has been working on his language skills for an hour three times a week since November. And his wife’s reaction to all of this?